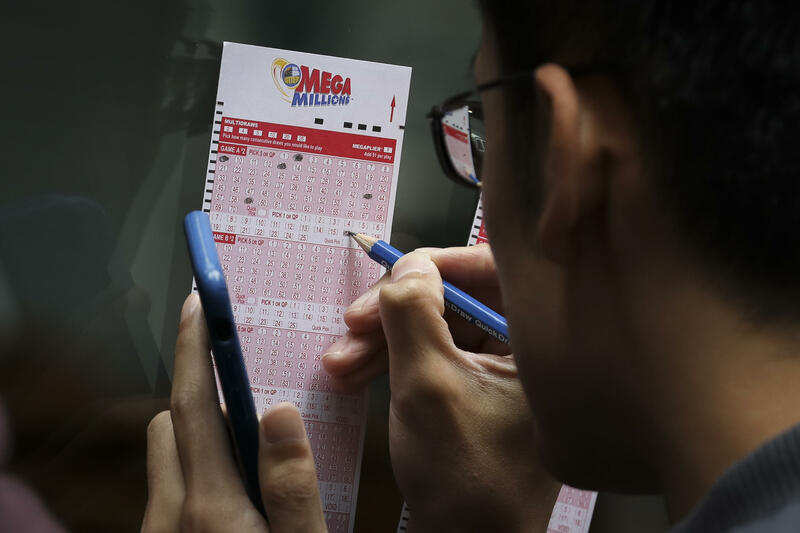 One winning ticket was sold for the record Mega Millions jackpot of what turned out to be just under $1.6 billion. The winning ticket was purchased in South Carolina at the KC Mart #7 in Simpsonville, in the northwest part of the state. The lucky winner has not yet been identified. The six winning numbers were drawn Tuesday night. On Wednesday morning, lottery officials said in a statement the jackpot was worth $1.537 billion, nearly $50 million less than the previously estimated jackpot of $1.6 billion. South Carolina Education Lottery spokesperson Holli Armstrong said it was the state's first Mega Millions jackpot win. Its previous lottery record haul was a $399 million Powerball jackpot. South Carolina lottery officials also said whoever holds the winning ticket has 180 days to claim the prize and they can stay anonymous if they choose. The retailer where the ticket was sold gets a $50,000 cut once the prize is claimed. Tickets had to match all five white balls from Tuesday night's drawing as well as the yellow Mega Ball to claim the jackpot. In addition to the grand prize winner, the Mega Millions website says 36 tickets matched the five white balls to claim $1 million apiece. They were bought in 17 states and the District of Columbia. A Texas winner and one in Florida included the optional Megaplier, so those two tickets are worth $3 million each. The jackpot's lump-sum cash value was $878 million, an option favored by most winners. Otherwise, the jackpot is doled out over 29 years. The Mega Millions jackpot had been soaring since July, when a group of office workers in California won $543 million. If no one had matched Tuesday's numbers, officials say the next drawing would have been for an estimated $2 billion jackpot. It will be held Friday night but for an estimated $40 million jackpot. Mega Millions has more than 302 million possible number combinations. Lottery officials had expected to sell 75 percent of them by Tuesday night's drawing, when Mega Millions host John Crow announced the winning numbers. "A million dollars is life changing. But a billion dollars is extraordinary," Crow told CBS News. "So that excitement, that enthusiasm that is generating right now is what's great about this jackpot." Officials say the previous record Mega Millions jackpot was $656 million, which was shared by winners in Kansas, Illinois and Maryland. The drawing was on March 30, 2012. Mega Millions tickets are $2 and are sold in 44 states, Washington, D.C., and the U.S. Virgin Islands. The world record jackpot remains a Powerball prize of $1.586 billion, which was matched in January 2016 by three tickets, from California, Florida, Tennessee. A previous record-holder was another Powerball jackpot, $758.7 million, won by a single ticket holder, from Massachusetts, in August 2017. Powerball will hold its drawing Wednesday night for a jackpot estimated at $620 million or a cash value of $354.3 million. It will probably be days or even weeks before a winner steps forward to claim the prize, The Associated Press points out, adding, "Lottery officials and financial managers encourage people to take time to map out a strategy for investing their hundreds of millions of dollars, and winners must deal with security concerns befitting someone who suddenly is immensely wealthy. Depending on the state, winners have from 180 days to a year to claim their prize." Winners can stay anonymous in seven states in addition to South Carolina, but in the rest, winners' names are made public. The size of Tuesday's jackpot is part of a trend toward bigger and bigger ones that took hold when Mega Millions and Powerball changed their rules and made the odds longer seeking better sales, the AP notes. The odds of winning a jackpot remain abysmal at 1 in 302.5 million for Mega Millions and 1 in 292.2 million for Powerball. On average, that's $206.69 per person. "Our obsession with lotteries, with gambling, is that unicorn feeling of, like, 'Maybe it'll be me,"' CBS News business analyst Jill Schlesinger said. She points out some people don't necessarily play to win.